Wring the spinach dry in a clean dishtowel. Separate with your fingers to loosen. Place a rack in the lower third of the oven and pre-heat the broiler. Heat the olive oil, a turn of the pan, in a skillet over medium to medium-high heat. Melt the butter into the oil; when it foams, add the onion and garlic. Season with salt and pepper and stir for 3-5 minutes to soften. Stir in the flour for 1 minute or so. Whisk in the milk and let thicken; season with nutmeg, to taste, and reduce the heat to low to keep warm. Salt the boiling water and cook the shells to al dente. Reserve 1/2 cup of the starchy cooking water and add it to the milk sauce to thin it a bit. Add the spinach to the pasta pot to heat; stir, then drain the pasta and spinach and toss with the sauce, adjusting the salt and pepper, to taste. Arrange in a casserole dish and dot with the ricotta cheese mixed with the lemon zest and thyme. Top with the mozzarella and grated cheese and broil until brown and bubbly. Serve immediately. In Recipes-list.com we have selected the most viewed recipes from category - uncategorized . Enjoy the best recipes specially selected for you! 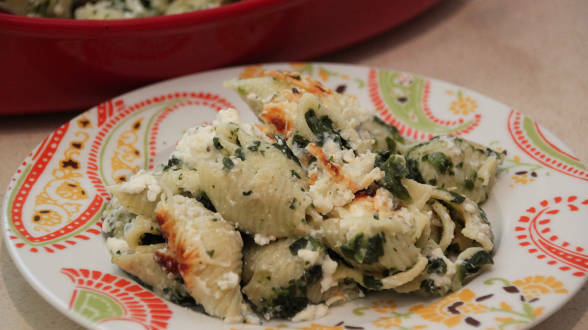 Unstuffed Shells is the right choice that will satisfy all your claims.